Ingredients: Aqua (Mineral Spring Water), Ethylhexyl Palmitate, Ceteareth-30, Cetearyl Alcohol, Cetyl Alcohol, Glycerin, Sodium Cetearyl Sulfate, Hamamelis Virginiana (Witch Hazel) Flower Water, Propanediol (Corn derived Glycol), Phenoxyethanol, Ethylexylglycerin, Maris Sal (Dead Sea Water), Dimethicone, Parfum (Fragrance), Allantoin, Linalool, Hexyl Cinnamal, Hydroxyisohexyl 3-Cyclohexene Carboxaldehyde, Butylphenyl Methylpropional, Coumarin, Alpha Isomethyl Ionone, Citronellol, Geraniol, Isoeugenol, Benzyl Alcohol, Benzyl Benzoate, Benzyl Salicylate. My room mate has really dried cracked skin on his hands from dealing with freight all day . I have bought several high end products that did not work . This is in my top two , with the other being from Skin & Co , they also have a mini set . I will continue to purchase both . One set for him , one for me . I have eczema and find that most hand creams are not soothing. AHAVA is exactly that. Very soothing. Does not cause additional skin irritation. Having the mini hand creams I can keep them in all the places I need instant relief. The smell is very light. Bought two sets and would definitely buy again. OK, you just have to try it! I purchased this lotion and the bath salts for my grandsons teacher, and some relatives on his dads side, and I have one for myself. Well people the lotion is amazing and the bath salt as well. I have been hearing such great responses and thanks! Really all you have to do is try it, and you will love it! I absolutely love this product! 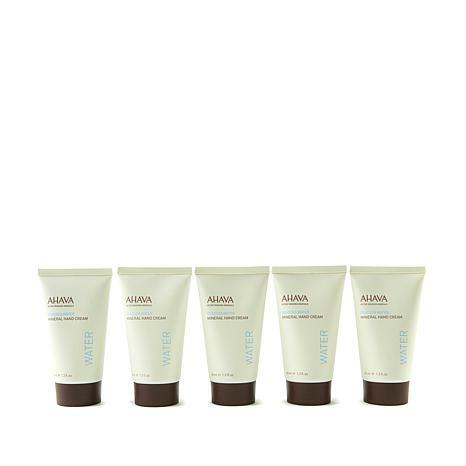 Its a light creamy hand cream thats not greasy and absorbs so quickly. My hands feel soft and relieved immediately! The small sizes are perfect to use everywhere. I have them in my purse, on my nightstand and in my desk at work. Also great size for plane travel restrictions! 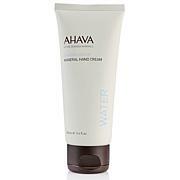 For more than 20 years, Ahava has been responsibly harvesting Dead Sea ingredients and combining them with botanical extracts to create among the finest nature-inspired face and body products. Powering the entire product range is the exclusive Osmoter™ -- a perfectly balanced concentrate of Dead Sea minerals. Remind me about AHAVA upcoming shows. Dr. Jeannette Graf, M.D. Rejuvenation Retinol Hand Creme Think about your hands. Think about everything they've done for you. Typed that 200-page dissertation. Painted that charming landscape. Won that tennis championship. Held that beautiful baby. It's your turn to do something nice for your hands.